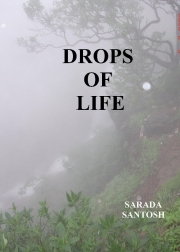 Description of "DROPS OF LIFE"
Our existence consist of known and unknown, real and unreal, conscious and subconscious. The conscious life begins at our birth and ends at death.Anything before the birth and after the death lies in the realm of unknown. However the unknown just lies at edge of our consciousness. We always feel them around us in a subtle way. We crave to understand them but they always remain beyond our reach. There are no shortcuts for life. We have to go through each and every aspect of life before we are qualified to understand them. The life comes to us in innumerable ways as happiness, pain, sufferings, tragedy, war, peace, joy, poverty, abundance etc . One life may not be sufficient for that. Life is a continuous process for some, while for others life comes as raindrops. It drenches us with various experiences and vanishes into the ground below. This book is about some of those drops. Mrs Sarada is a civil engineer with deep interests in literature and science.She is helped by her husband during the various stages of preparation of this book, who keeps similar interests. Reviews of "DROPS OF LIFE"